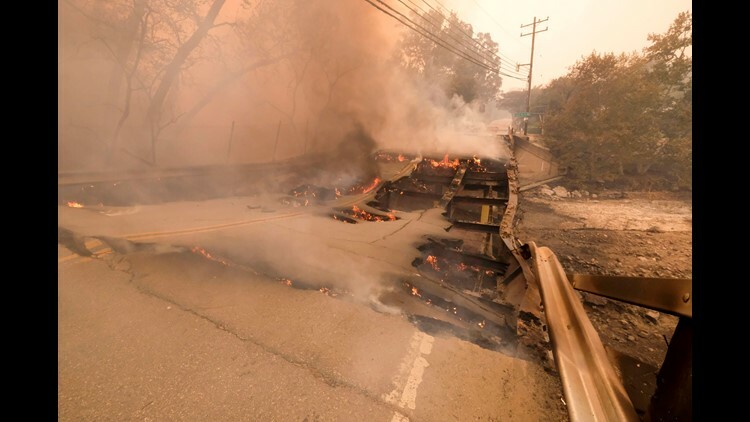 The Woolsey fire burns the bridge on Mulholland Highway near Kanan Road in Malibu, Calif., on Nov. 9, 2018. 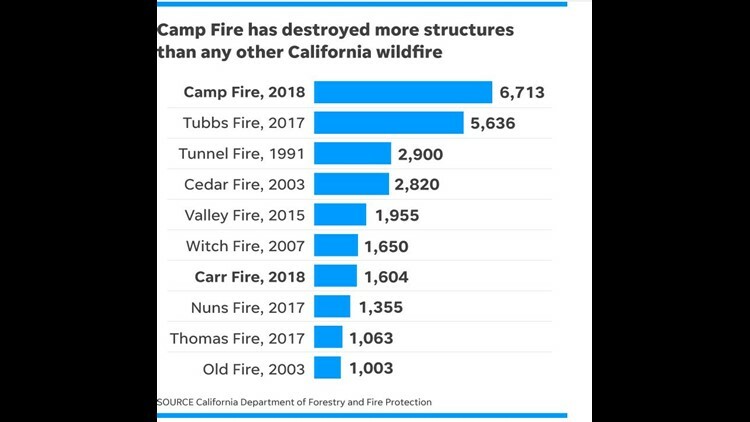 The wildfire that devastated the northern California city of Paradise this week already the most destructive in state history in terms of structures burned, and the toll is likely to get even worse. More than 6,700 structures burned to the ground in northern California’s Camp Fire on Thursday and Friday, eclipsing the previous tally from last October’s Tubbs Fire in the wine counties of Napa and Sonoma, according to the California Department of Forestry and Fire Protection. Authorities have not yet given a tally of structures destroyed by the Hill and Woolsey fires now burning in Ventura and Los Angeles, in Southern California. The fires have killed at least nine people, driven more than 250,000 people from their homes and scorched over 140 square miles. The Camp Fire started 80 miles north of Sacramento, and officials still do not know a cause as it continues to spread. Meanwhile, thousands of residents in Southern California have been ordered evacuated in Ventura and Los Angeles counties, with the Los Angeles County Fire Department tweeting: "imminent threat." Los Angeles fire officials said the fire is "zero contained" as homeowners fled the tony beachside enclave of Malibu on Friday afternoon. The swift-moving Camp Fire moved Friday morning into the eastern side of Chico, a city with a population of around 90,000. Fire officials said strong winds had hampered efforts to control the blaze. Smoke from the Camp Fire drifted into the San Francisco Bay Area, while the Southern California fires brought grey skies to large parts of the Los Angeles area.